PSEG Long Island is expanding current circuit reliability work in the Town of Riverhead. The utility is adding additional work locations to better improve the reliability of the electric grid for its local customers. Photo by: PSEG Long Island on Facebook. Uniondale, NY - November 10, 2015 - PSEG Long Island is expanding current circuit reliability work in the Town of Riverhead. The utility is adding additional work locations to better improve the reliability of the electric grid for its local customers. 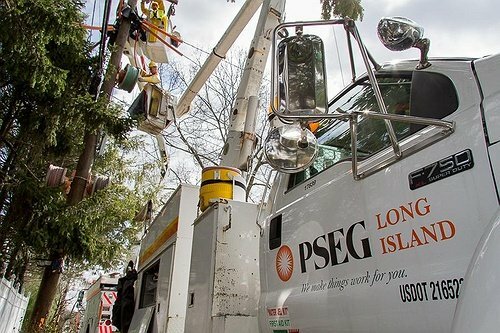 Beginning November, and lasting approximately six months, PSEG Long Island licensed and approved contractors will be working on system improvements in the Town of Riverhead. Work will include replacing existing wires, installing new and more durable poles, and installing or replacing switching equipment to help reduce the number of customers affected by an outage. “Increasing the number of FEMA projects in Riverhead will provide greater reliability to even more of our customers in the area and will allow us to continue on our mission to be the best-in-class electric utility our customers deserve,” said John O’Connell, PSEG Long Island vice president of transmission and distribution operations. This project is funded through the FEMA Hazard Mitigation Assistance Program, which was established to harden electrical distribution infrastructure against future storm damage and help restore power more quickly. Earlier this year, more than $729 million of federal recovery funds were secured for the Long Island Power Authority via an agreement last year between Governor Andrew M. Cuomo and the Federal Emergency Management Agency (FEMA), under the FEMA 406 Mitigation Program. For more project details, visit here. LongIsland.com's 2014 March Family Fun Guide: St. Pat's, Mardi Gras & More! Subject: LongIsland.com - Your Name sent you Article details of "PSEG Long Island Adds More FEMA Reliability Projects in Riverhead"